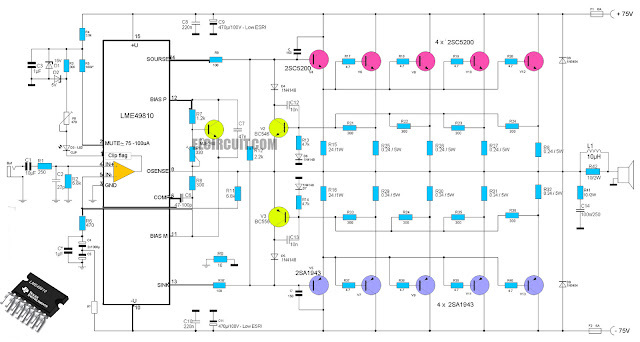 High-End Power Amplifier Circuit using ic LME49810 as a driver amplifier and using Transistor 2SC5200 2SA1943. LME49810 is a high fidelity audio power amplifier buffer driver. High-End Power Amplifier output power may be scaled by changing the power supply voltage and number of final stage transistors (Transistor Booster) . The LME49810 minimum output current is 50mA. When using a discrete output stage the LME49810 is capable of delivering in excess of 300 watts into a single-ended 8Ω load. Unique to the LME49810 is an internal Baker Clamp. This clamp insures that the amplifier output does not saturate when over driven. The resultant “soft clipping” of high level audio signals suppresses undesirable audio artifacts generated when conventional solid state amplifiers are driven hard into clipping. The LME49810 includes thermal shutdown circuitry that activates when the die temperature exceeds 150°C. The LME49810's has mute function, when activated, mutes the input drive signal and forces the amplifier output to a quiescent state.